A French ship joined the international effort to hunt for the black boxes and other wreckage of EgyptAir Flight 804 Monday, searching for clues to what brought the plane down, as Greek and Egyptian authorities diverged on what happened to the plane during the crucial final minutes before it crashed into the Mediterranean, killing all 66 people on board. Five days after the air disaster, questions remain over what happened to the doomed jet before it disappeared off radar at around 2.45 a.m. local time Thursday. Egyptian authorities said they believe terrorism is a more likely explanation than equipment failure, and some aviation experts have said the erratic flight reported by the Greek defense minister suggests a bomb blast or a struggle in the cockpit. But so far no hard evidence has emerged. A 2013 report by the Egyptian ministry of civil aviation records that the same Airbus 320 made an emergency landing in Cairo that year, shortly after taking off on its way to Istanbul, when one of the engines "overheated." Aviation experts have said that overheating is uncommon yet is highly unlikely to cause a crash. The head of Egypt's state-run provider of air navigation services, Ehab Azmy told The Associated Press that the plane did not swerve or lose altitude before it disappeared off radar, challenging an earlier account by Greece's defense minister. Azmy, head of the National Air Navigation Services Company, said that in the minutes before the plane disappeared it was flying at its normal altitude of 37,000 feet, according to the radar reading. "That fact degrades what the Greeks are saying about the aircraft suddenly losing altitude before it vanished from radar," he added. "There was no turning to the right or left, and it was fine when it entered Egypt's FIR (flight information region), which took nearly a minute or two before it disappeared," Azmy said. According to Greece's defense minister Panos Kammenos the plane swerved wildly and dropped to 10,000 feet before it fell off radar. Greek civil aviation authorities said all appeared fine with the flight until air traffic controllers were to hand it over to their Egyptian counterparts. The pilot did not respond to their calls, and then the plane vanished from radars. Human remains of the victims arrived at a morgue in the Egyptian capital, Cairo, where forensic experts were to carry out DNA tests, according to the head of EgyptAir, Safwat Masalam. A security official at Cairo morgue said family members had arrived at the building to give DNA samples to match with the remains, which included those of a child. He spoke on condition of anonymity because he was not authorized to brief the press. Egypt, which is sending a submarine to search for the flight recorders, has also refuted earlier reports alleging that search crews had found the plane's black boxes — which could offer vital clues to what happened in the final minutes of the flight. 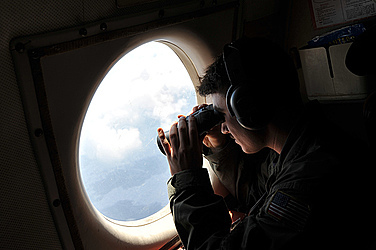 Ships and planes from Britain, Cyprus, France, Greece and the United States are taking part in the search for the debris from the aircraft, including the black boxes. Some wreckage, including human remains, has already been recovered. The French vessel that joined the effort Monday is equipped with sonar that can pick up the underwater "pings" emitted by the recorders. It is specialized in maritime surveillance, and rescue and marine police missions. The 80-meter (262-foot) ship left its Mediterranean home port of Toulon Friday with a crew of 90, including two judicial investigators. The search area is roughly halfway between Egypt's coastal city of Alexandria and the Greek island of Crete, where the water is 8,000 to 10,000 feet (2,440 to 3,050 meters) deep. The official website of the Egyptian Aircraft Accident Investigation Directorate, which is affiliated with the Ministry of Civil Aviation, gave details of a 2013 incident in which the plane in question had to make an emergency landing. It said that the EgyptAir A320 GCC took off from Cairo airport heading to Istanbul at 2:53 and that when it reached an altitude of 24,000 feet the pilot noticed that one engine had overheated. A warning message appeared on the screen reading, "engine number 1 stall." After checking on best measures to take, the pilot headed back to Cairo airport where a maintenance engineer inspected the engine, disconnected it, and sent it to be repaired. There were no injuries, no fire, and no damage to the plane, the report read, adding that the engine had a technical problem. The report is one of over 60 reports classified as incidents, serious incidents and accidents that took place between 2011 and 2014. Among them, 20 involved A320 Airbus planes, the highest among any other aircraft. Experts contacted by AP said that while an overheated engine is not a common problem, it is unlikely to cause a crash. David Learmount, a widely respected aviation expert and editor of the authoritative Flightglobal magazine, said, "engine overheat is rare but it happens." He said that the pilot can shut down the engine and aircrafts can operate with a single engine. "I don't think engine overheat alone has ever caused an aircraft to crash. An engine fire could cause a crash but has not done so in the modern aviation era," he added.